Item # 310070 Stash Points: 895 (?) This is the number of points you get in The Zumiez Stash for purchasing this item. Stash points are redeemable for exclusive rewards only available to Zumiez Stash members. To redeem your points check out the rewards catalog on thestash.zumiez.com. Show off your style in the Chains crew socks from DGK. White socks are accented with green and red stripes with gold chains throughout for high style fashion. Complete with extra padded toe to heel comfort and added elastic arch support, these socks will not only make you look great starting with your feet but they will also be super comfortable. 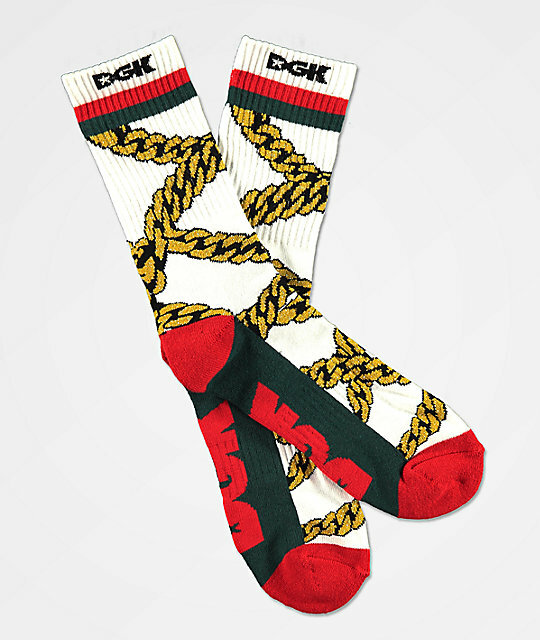 Chains Crew Socks from DGK. Green, red, black and gold detailing throughout. DGK logo script on footbeds in red.